Safety goggles! Ventilation or better exhaust hood! Absolutely avoid contact with benzene, nitrobenzene and nitrating acid (perhaps wear protective gloves, do not inhale vapors)! Fill beaker with cold water. Fill pear shaped flask with approx. 25 ml cold water and have in readiness. Add 1 ml nitric acid 65% to the test tube, then accompanied by water cooling slowly add 2 ml sulphuric acid 96%. Add 1 ml benzene to the cooled off nitrating acid. Carefully sway back and forth until a noticeable warming begins (about 40 - 50°C), then cool. Now continually sway back and forth, cooling again if warming occurs, until no further warming is noticeable (about 2-3 minutes). The lipophilic phase which floats on top becomes yellow and oily during the reaction. Now pour the reaction mixture into the pear shaped flask. The nitrobenzene sinks to the bottom in oily drops. After a few minutes one can pipette off the red nitrobenzene. It has a distinctive marzipan odor (comparable to benzaldehyde), test carefully! One can dispose of the nitrating acid as halogene-free organic waste. One can save the nitrobenzene for further experiments, otherwise it can be disposed of as halogene-free organic waste. After the experiment, thoroughly clean the flask and beaker with acetone or the like, and dispose of the cleaning agent likewise as halogene-free organic waste. Benzene is only moderately activated with respect to electrophilic substitution. Therefore concentrated sulphuric acid must be added for the insertion of the nitric acid nitro group. As nitrobenzene is still less activated, under these conditions only one nitro group is inserted into the benzene nucleus. 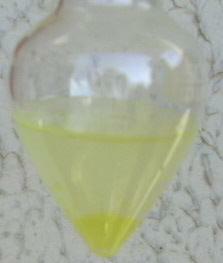 The reaction mixture shortly after the addition of benzene. The reaction mixture towards the end of the reaction. Nitrobenzene is heavier than the highly diluted nitrating acid and settles.